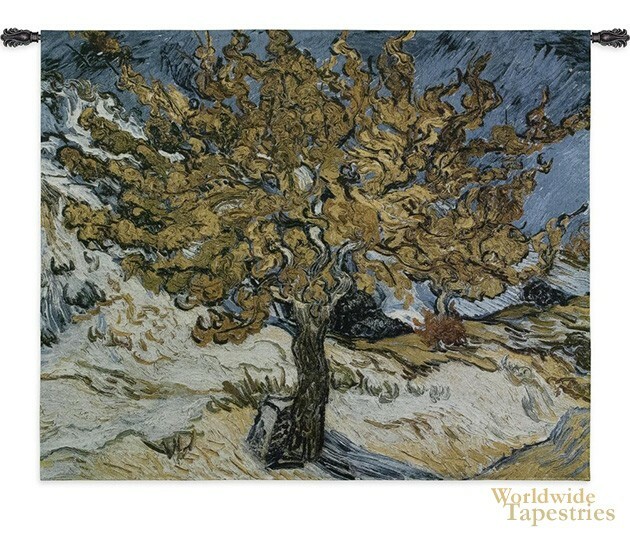 The Mulberry Tree tapestry shows the work painted in the fall of 1889 when Vincent van Gogh was almost in the state of mania. “The Mulberry Tree” represents his passionate feelings about what he saw. He believed this to be the best of his mulberry tree paintings, in which the tree is seen uniquely through his eyes. The texture of the original piece is simply extraordinary, made possible through a process called impasto, where the paint is applied so thick it appears three dimensional when dry. The result is both spontaneous and brilliant. The fiery branches of twisting yellow burst from the tree, reaching for the bright blue sky. This wonderful tapestry captures van Gogh’s work perfectly. The Mulberry Tree tapestry comes lined and has a tunnel for easy hanging. Note: tapestry rod and tassels, where pictured, are not included in the price. Dimensions: W 53" x H 44"